Well, thank goodness (pun intended) that I don’t wear makeup, because I am sitting at my desk with tears running down my face. I miss her too !!! I was up at the lake on Sunday and I had a question to ask and I turned to my husband and started to say oh I will ask Dorothy. In mid sentence he looked at me and smiled. I do that quite often as she was always our department memory. I am so glad you were able to hang that picture of you guys. She loved going there with you !!!! Thanks for loving and remembering her, Bonnie. She was such a ball of love and just got brighter and more brilliant when surrounded by people who loved her. Yes to both questions – stronger because of my roots some of which I had to overcome. My acupressure practitioner and I had a discussion about family legacy. We came to the conclusion that all of us are challenged with the task of living up to a legacy or living it down. 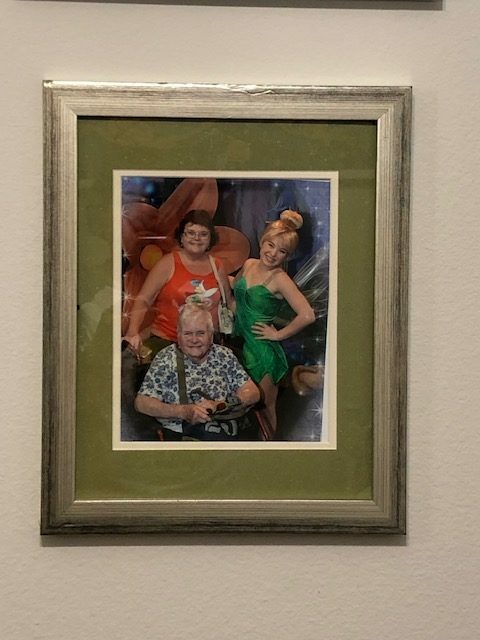 Love the Tinker Bell picture. I remember a post about you getting done up as Tinker Bell. Will that picture be hung beside the one above? That’s a great idea, Mona!